lizard | Buried words and Bushwa. The racehorse of the desert. 1934. What do you think of when you hear that title, the racehorse of the desert? When I read it I immediately thought of a camel. Quite fast when they want to be and appropriately adapted for running in sand. We have quite a few wild camels here in Australia, in fact, we have the largest wild population of them in the world. 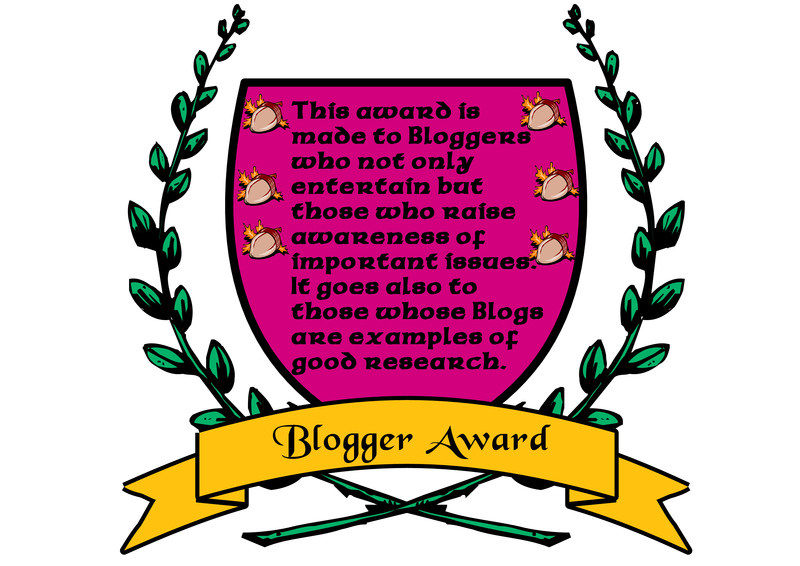 Considering that they are an introduced species that is quite an achievement. Anyway, I would never have connected that particular title to this vision of a gigantic lizard, would you? After the wonderful clarity of the photos of an 1934 outback christmas I used in my post yesterday I went back to that particular paper to see if they had any other gems and these guys were on the very next page. 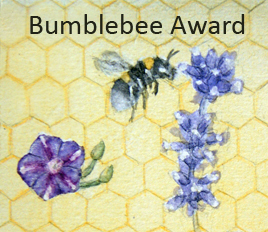 Fortunately this time there was a note as to who took the picture and we can thank Mrs. E. Lambert and E. Tindale for these pictures. Scaly BBQ cleaner. Watch your fingers! 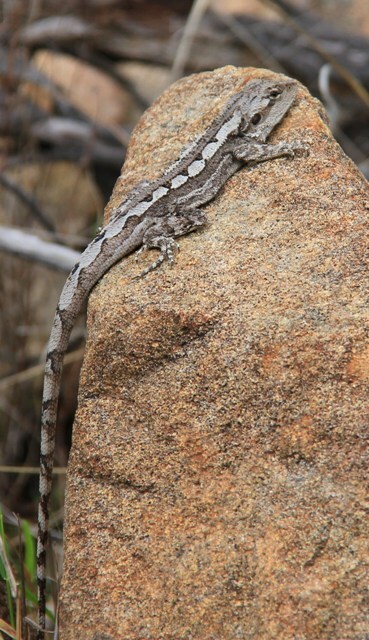 I have posted about lizards here before*, we often come across interesting ones in our travels and have heaps of small skinks in our garden, as does probably everyone in Australia. 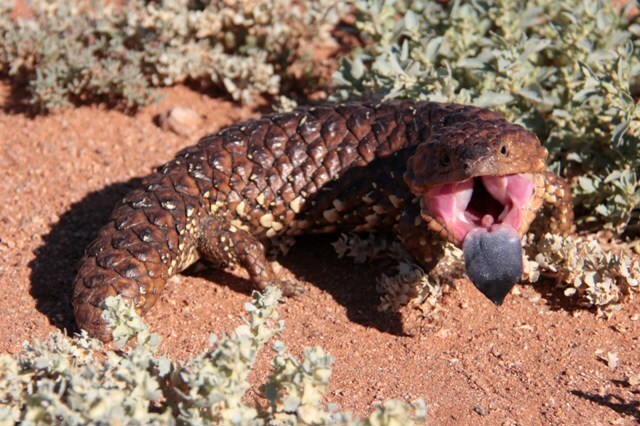 We also have Blue-Tongue lizards who live under the house and eat the frogs (grrrrr). This post is about a lizard we haven’t had in our garden though, a Goanna. Goannas can be quite big and are pretty scary looking, but would rather run away from you than attack you. If we see one when we are driving through the bush they generally run up the nearest tree to get away. Still, I don’t recommend you mess with them. I was amused to find this article from 1948 about a goanna infestation at St Arnaud. I bet poor young Noel Petrie wasn’t amused after being chased through a paddock by two marauding goannas though. A near miss and an angry lizard. 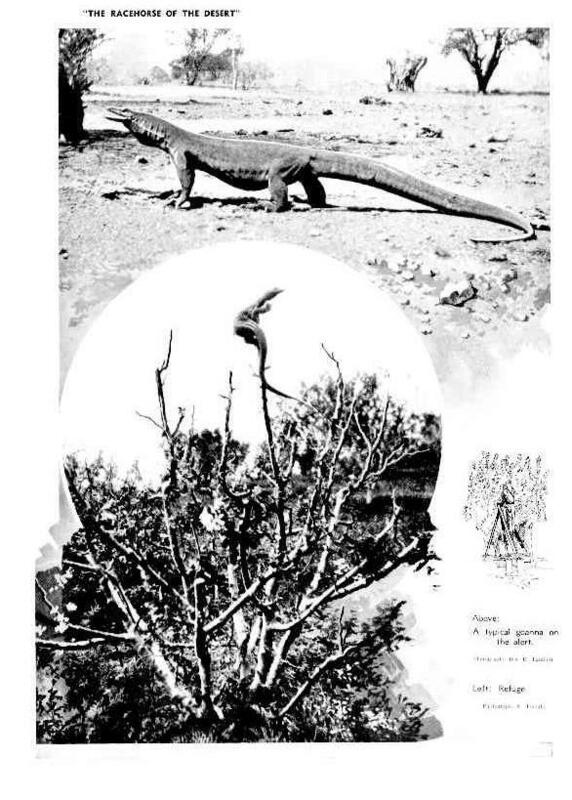 Here in Australia we have a lot of different types of lizards, big ones and small ones but I think the guy in this photo from 1935 would have to be one of the biggest of them all! This lizard is a 6ft long Bungarra (Sand Goanna) and can you imagine what was going through the mind of the dog in the background (which looks like a Border collie to me just for sizing purposes) when it wandered up? The dog was tied to the kennel after all which means that escape was not on the cards…. *cue Jaws music*….. These lizards eat pretty much anything that fits in their mouth, and at this size that means pretty much everything that crosses its path is in danger. 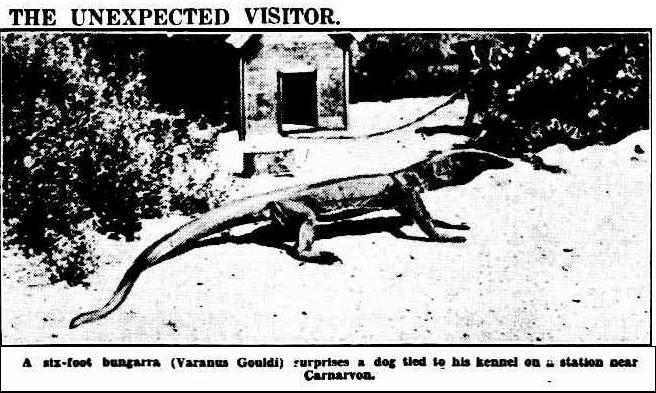 My favourite old newspaper article about lizard was this post, The Mysterious Kumi and after seeing this photo I can readily imagine people believing in reptilian monsters! 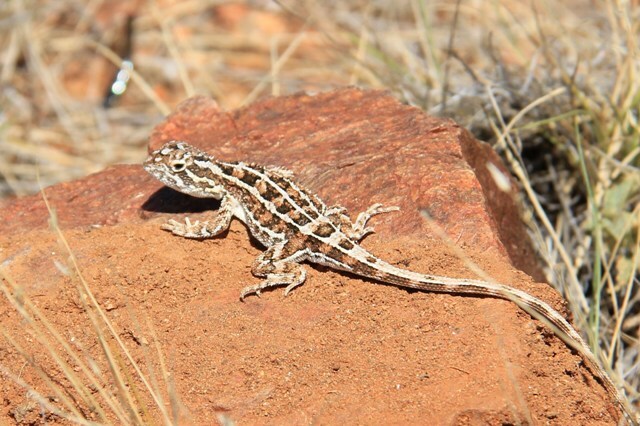 I have done a few other posts about lizards over time, most recently about the lizards we came across on our holiday; a grumpy Stumpy Tail, a Jacky Dragon and a sunbather at Silverton. A wandering drive and another lizard, a happier one this time! We went for a drive through the bush last Tuesday. For us a drive through the bush means picking a track and driving until we find a more interesting one, then driving down that one, repeat, repeat, repeat. We never get lost because we never have a destination, and we never really know where we are in the first place! The only rule is that we have to be looking for a main road by about 4pm-ish, otherwise it will be dark before we know it. Once we found some bushwalkers, one of their group had twisted his ankle badly and it was pouring with rain. We stopped and managed to stuff him, and his huge backpack, in the 4WD with us and give him a lift back to their camp at the bottom of the mountain. He was pretty lucky we chose that particular track that day, it would have been a long hop otherwise! We always drive slowly, as we are too busy looking at the things around us to be bothered getting to the end of the track quickly. We reversed back and sure enough there was a Jacky Dragon (I love that name!) sucking up the last few rays of the day. The kids and I got out quietly and wandered over to get a better look. The lizard was very cute and wasn’t too bothered by us. I managed to take a few photos before we left him to finish his sunbathing. I couldn’t believe that number 1 had even spotted him as he was well off the track, and so camouflaged on the rock I needed him to be pointed out to me! At least this lizard was a happier specimen than the last one I posted about. 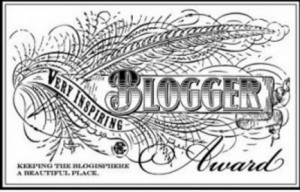 No grumpy hissing and tongue flicking this time! When we were driving on the road to the Daydream mine the other day the Man pulled over for yet another photo opportunity only for me to almost grab the steering wheel and steer us back into the road. 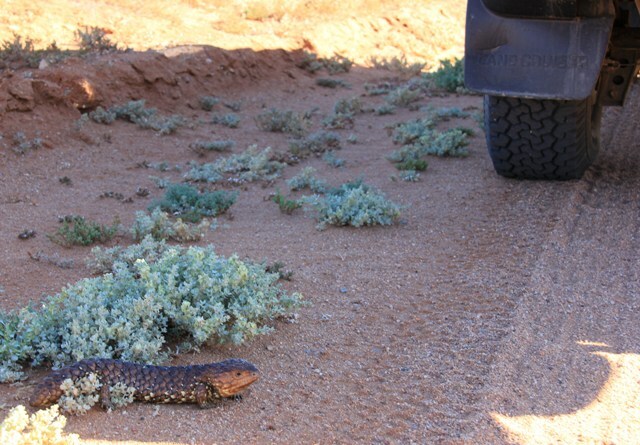 We had pulled over right where a Stumpy Tail lizard was sunning itself, and nearly ran over its head. They love heat of the roads and are often seen warming up on the sides. Unfortunately they are often seen squashed as well as they are not expecting a car to come zooming along. This one was lucky that he stayed still as the tyre tracks from our car ran right in front of his nose! I got out to apologize, and take a picture and, unsurprisingly, I got a bad reception. He put on a good show, standing up tall, well, as tall as a Stumpy Tail can be, hissing and showing his blue tongue and the kids were delighted. They are lovely lizards, this one was just a little more annoyed than the ones we usually see around, for good reason I guess! When we were at the Mundi Mundi lookout the other day we naturally did a bit of wandering around in the nearby low scrub, in case we found any treasures. Luckily for me I saw this little treasure while he was sunbathing on his rock. He was happy for me to have a look at him for a few minutes, not even bothering to run off even when I called the kids over to have a look. Even me sneaking closer and closer with my camera didn’t alarm him and he was still there when we quietly walked away. Flat out like a lizard…. ummmm… sunbathing?